I’ve been in limbo about putting the house on the market since the middle of June, and I’ve alternated between working on final projects with frantic energy and then sitting paralyzed by the thought of all the projects that needed to be done. I hardly ever find it difficult to fall asleep, and I was up until 4 am on Sunday morning running through all the options. I finally made the decision today, and I’m going to stay put until spring. That will let me pay down the car a little more and save up a little more for a down payment. Plus, as a teacher, there are just some projects that it’s wiser for me to do during my relatively free summers, and packing the entire house, moving, and setting up a new household is definitely one of the projects on that list. Since an ugly unfinished walkway is not something that will win potential buyers over, some of my frantic activity included making myself go outside at nearly dark to put down the pavers for the new walkway. The timing was an effort to escape the horrendous heat, but on Saturday night, I was getting thoroughly saturated with my own sweat. Sorry, it’s gross but true. Then, I hit something metal. First, I made sure it wasn’t some crazy buried wire that would kill me. Then, I started running through all the possibilities. Dead body. Well cap for a well filled with hazmat waste. Buried treasure. 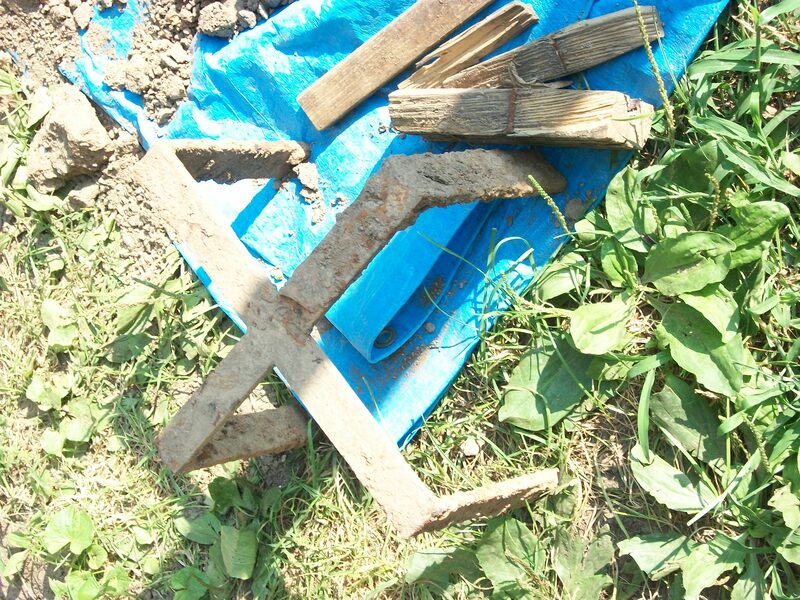 The metal that I unearthed was looking like an X. Yes, definitely buried treasure. But, darkness was settling in to the point that I couldn’t see much, and just in case I was digging up a dead body and not buried treasure, I decided to stop for the night. Plus, I was so hot. Ugh…so, so hot. I went out the next evening, and I kept on digging. I finally was able to pry the metal out of the ground. It’s a…uh…um…metal X with legs? 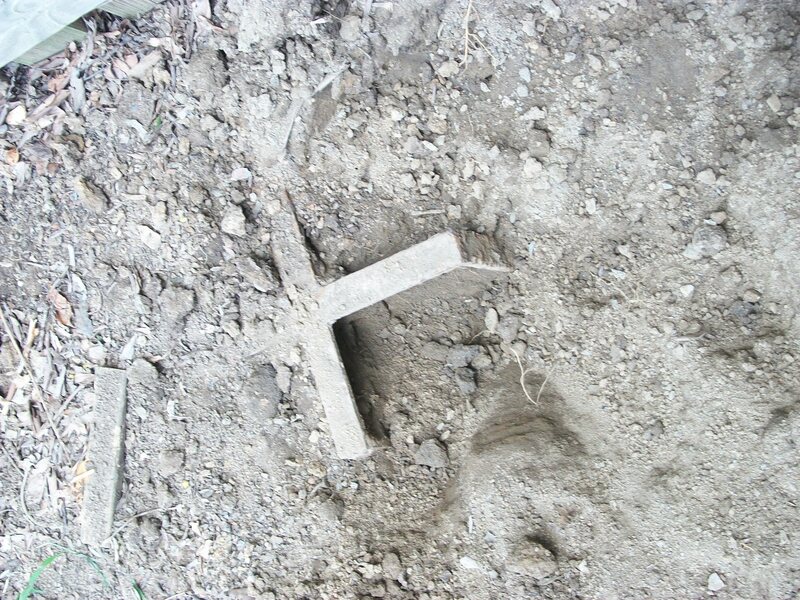 I dug deeper under it hoping that it marked treasure because stranger things have happened. But, the only reward I got for my effort was a hole too deep for the pavers and more sweat. Move along folks, there’s nothing here to see. Still, I’m pretty curious. I wish someone could tell me what this metal object is. I found out from my neighbor that our backyards used to be a meadow behind a butcher shop. I’m guessing that this metal has probably been buried at least since the house was built in the 1920s because it was just deep enough to stay buried during grass planting and just far enough from the detached garage that it would have remained undisturbed during its building. One friend suggested it could be an old surveyor’s mark. I’m wondering if it could have been used as a sort of cheater foundation at the corner of outbuildings. One of my former students suggest that I go visit the grave of John Cross in the old church graveyard downtown because she swears there is a treasure map coded into his tombstone. Any historians or archaeologists out there with any insights? This entry was posted in home improvement, that's life. Bookmark the permalink. ← Bowling or Travel, anyone?